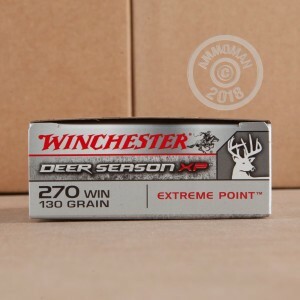 Deer Season ammunition from Winchester does just what it says on the box: bring down whitetail, blacktail, and mule deer with impressive consistency. Each .270 Winchester round in this box of 20 fires a 130 grain hollow point bullet at a muzzle velocity of 3,060 feet per second. The bullet is optimized to produce the right amount of expansion and penetration to bring down a deer-sized target. To this end, it has an oversize polymer tip that provides better accuracy in flight and initiates the expansion of the lead alloy core, generating a wide mushroom that has a good chance of dropping your quarry quickly given good shot placement. 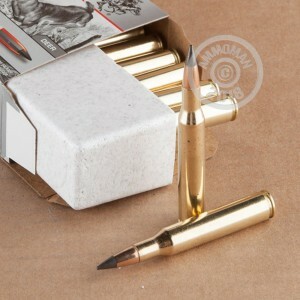 Shop at AmmoMan.com, home of free shipping and great savings for shooters. All orders over $99 ship at no extra S&H charge.